There are many ways to generate traffic to your business and website. In this article we’ll discuss one strategy that can be very EFFECTIVE for your bottom line. If it’s done correctly. To help with our discussion, special thanks goes out to a friend of ours Joann Dunsing who was kind enough to share her latest postcard with us. We’ll begin by reviewing the front and the back of her postcard. 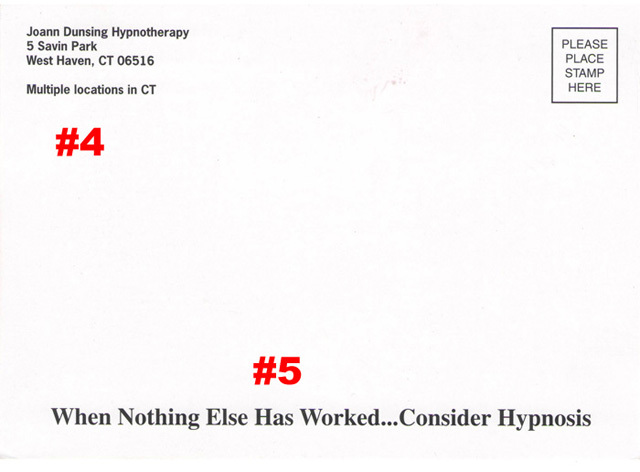 Then we’ll ask you to find the five (5) fatal flaws with her postcard. After our critique, we’ll review the three tips hinted at above. Does that sound fair enough to you? All three are absolutely critical for your marketing success. And failure to follow ALL three of these elements accounts for more wasted dollars then we care to discuss. As an aside, strict adherence to #2 is the reason why our Pay Per Click Campaigns have CTR (click thru rates) in the 2 to 7% range on a regular basis. Click the audio player below to learn how effective postcards can be for your business. Alright, now on to our case study. Lack of compelling headline, focusing on the problem or a specific OFFER. The large photo does NOT speak to your target audience (more on this later). Lack of a clear and compelling CALL TO ACTION. Lack of testimonials… too much white space. Failure to repeat a CALL TO ACTION or OFFER. This is critical. The job of your headline is to STOP people in their tracks. You’ve only got a second or two to keep your postcard out of their garbage can. And if your potential customer or client is like most people, they are sorting their mail VERY QUICKLY, typically over the barrel. Your website must get people to “raise their hand” by either becoming a prospect, or signing up for your service, or buy your product. Then ask your friends. Don’t tell them it’s your postcard… maybe mention that you got something in the mail and ask what they think of it. Now, ready for this. Turns out she used to be a Realtor. Ouch! Send this out the door, and 99 people out of 100 will make the exact same assumption that I did. And that’s because this LOOKS LIKE Realtor marketing. Okay, so if your marketing piece looks like realtor marketing, folks will think it is. And respond accordingly. I’m not suggesting that you can’t have an image of some sort there. Just make sure your image is about THEM. Not YOU. No one cares about your name, logo, or photo. So what does your potential customer care about? They care about themselves. They care about their own stuff. So make sure you have something there that speaks to THEM. No OFFER of any kind, just a laundry list of bullet points. What do we mean by OFFER? Well, think of it this way. Why should I respond to your freaking postcard? I clearly didn’t ask for it. So, if you are sending your marketing message my way, what is the “thing” you want me to know about and pay attention to? Dan Kennedy calls this creating “widgets.” A marketing “widget” (to borrow Dan Kennedy’s term) means the particular event or thing that helps me understand what you’re all about. For example, maybe her offer this week is to listen in on a free teleseminar for weight loss. Or maybe she put together a free report on how to stop smoking. Do you see what we’re driving at? This definitely ties in with your sales process. 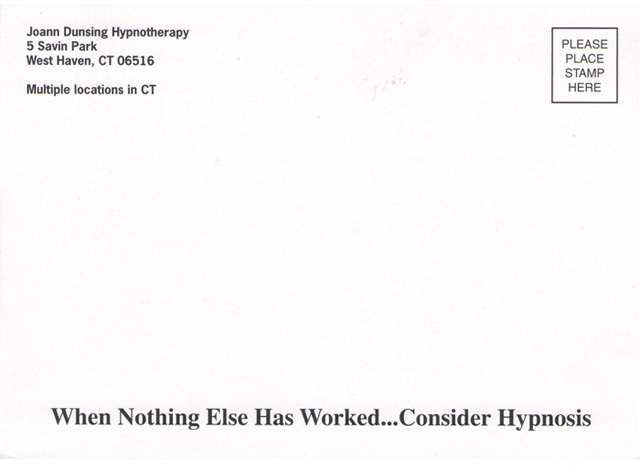 Meaning, it’s highly unlikely that a complete stranger is going to call you up for a hypnosis session after one point of contact, like your postcard. That’s why you NEED to include an offer, something tangible they CAN say yes to in order to get them moving in the right direction. Sidenote: Rob and I call this process “Next Step Marketing” which involves getting people to say “yes” to small, incremental steps all leading to a sale. Yes, it may seem hokey, but it works. So put something like “contact us today for your free report” or whatever. Ask people to contact you. Use a specific URL to track your campaign results. In this case, let’s say she has a page on her site that you can only reach by typing in the URL. Say, www.JoannDunsing.com/Smoking. With Google Analytics installed on the site, she’ll know how many people visited this specific page. Because most people do not hit marketing home runs out of the park first time at bat. Let’s say she hypothetically sent out 1000 postcards. If her site stats recorded 100 visits to the site, she would know that her POSTCARD (only 1 part of the sales process) worked at a 10% response rate. Knowing this will know if her postcard is doing the job. Of course, once they are on the page, it’s up to her website copy to continue “selling” her services. There is way too much valuable space simply getting under-utilized here. Here’s what I’m driving at. Clearly Joann has worked with clients in the past. A well placed testimonial here can do a lot to make you look trustworthy. The line “multiple locations in CT” does nothing for you. Granted, if her message is targeting a large geographic area, maybe her point is to let the recipient know that she’s available. Close by. But it’s just not strong enough. Additionally, where is your contact info on this side? Put your phone number, email address, and/or website on this side as well. Well, you have no idea which side the person will look at first when they get your postcard. Failure to include anything critical here is a good reason why many postcard campaigns fail miserably. You need to repeat your call to action and your offer here. It’s a must. Take nothing for granted. Assume this side will get read first, and put something compelling there. Now let me ask you a question. Do you think having this reviewed BEFORE printing out 5000 pieces would have been worth the time? And the fee? How effective do you think this postcard was for generating website traffic, or new business? Have you used postcards (or other off-line media) to drive traffic to your website, or your business? If so, how successful was your campaign? Do you need help creating a marketing campaign using postcards? Need some ideas or oversight to ensure that your postcard campaign is successful for you? Whether you’ve already tried postcards to marketing your business, or you would like to use postcards for the first time, we can help. To learn more, simply leave us a comment on the page and we’ll send you an email to begin the discussion. 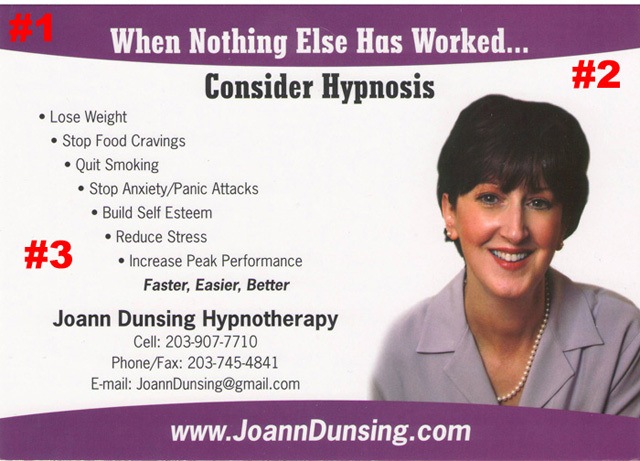 If you’d like to send us a sample of your marketing materials for a free critique, fax your postcard to: 866-274-0406. Yes, we are a web marketing company. And sometimes that means we are a web MARKETING company. It’s not about technology. It’s about how you use it to grow your business. It’s not about your website. It’s about the language and message on your website as it relates to your business. It’s not about you. It’s about communicating the value you provide to your present and future customers and clients. And that is a marketing issue. Interested to discover how our web marketing firm can help solve your online (and offline) marketing problems or issues? Just leave your comment for us here on the page.